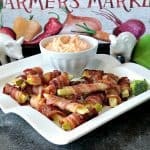 The idea for these Bacon Wrapped Broccoli Stalk Appetizers came to me one night as I was preparing broccoli for dinner. I’m not normally a broccoli stalk eater, but disposing of them is awfully wasteful. That’s when my lightbulb moment hit, and the results are utterly delicious! 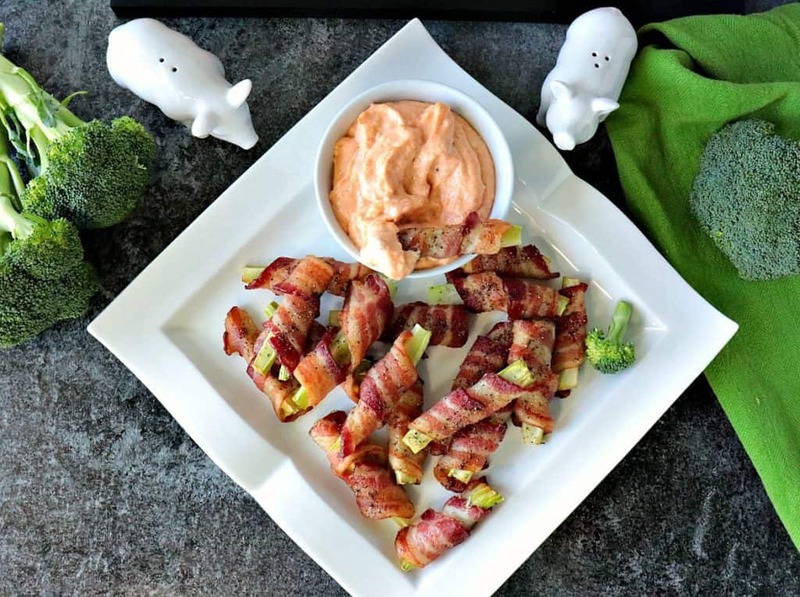 When the brainstorm hit to make these Bacon Wrapped Broccoli Stalk Appetizers the thought was followed shortly after to make a dipping sauce to accompany them. That’s where the idea for creamy smoked paprika horseradish sauce came in. **Please Note – The printable recipe card with detailed instructions and complete ingredient measurements for making Bacon Wrapped Broccoli Stalks is available near the end of this post. The next time you’re preparing broccoli florets, don’t forget to save your broccoli stalks to make this recipe. You can store the broccoli stalks in an airtight container in the fridge for up to 3 days. OR, perhaps the next time you’re preparing Bacon Wrapped Broccoli Stalk Appetizers, you can save the broccoli florets in an airtight container in the fridge for up to 3 days. As long as you make this recipe it doesn’t really matter in which order you accumulate your broccoli stalks. Just as long as you do. Sprinkle each Bacon Wrapped Broccoli Stalk with salt and pepper and bake in a preheated 425-degree oven for 15 minutes. Serve with chilled Smoked Paprika Horseradish Dipping Sauce. This sauce is COMPLETELY AMAZING and tastes simply incredible on burgers, sausages, pork, and even chicken! You’re welcome!! I did my best to produce the following fun and fast-paced video of the making of Bacon Wrapped Broccoli Stalks with Creamy Smoked Paprika Horseradish Dipping Sauce. I hope you’ll find it entertaining and helpful. If you enjoy this video, please don’t forget to subscribe to my Kudos Kitchen channel on YouTube. Thanks so much!! Don't waste that broccoli stalk! Trim it and wrap it in bacon for an appetizer treat that it out of this world! Wrap the prepared broccoli stalks with bacon and place them on a baking sheet with the ends down to avoid unraveling while baking. Sprinkle the bacon wrapped broccoli stalks with salt and pepper. Bake the bacon wrapped broccoli stalks in a preheated oven for approximately 17-20 minutes, or to your desired bacon doneness. 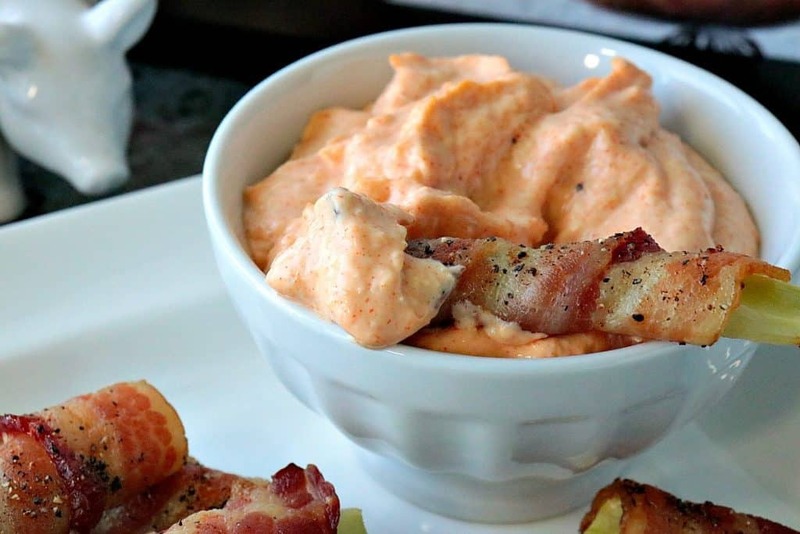 Meanwhile in a small bowl stir together the mayonnaise, smoked paprika, and horseradish. Chill until ready to serve. 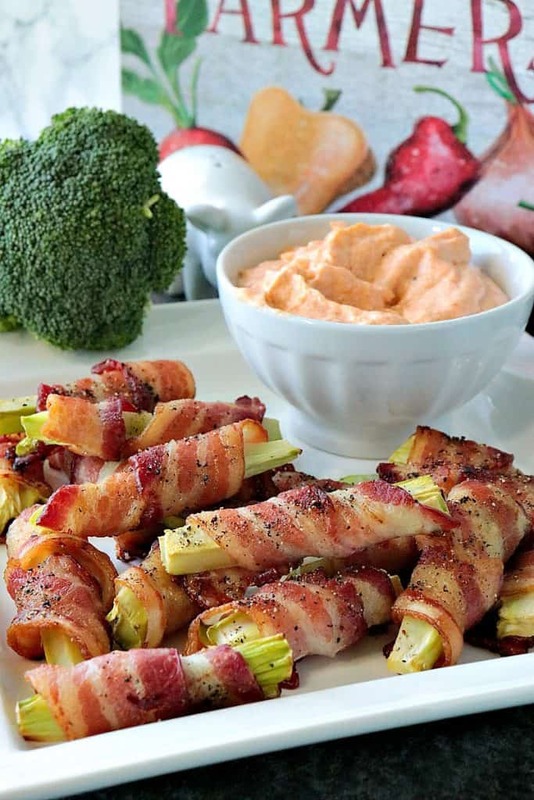 Serve the bacon wrapped broccoli stalks hot or warm with the chilled smoky paprika horseradish dipping sauce. I sincerely hope you’ve enjoyed today’s recipe for Bacon Wrapped Broccoli Stalks with Creamy Smoked Paprika Horseradish Dipping Sauce as much as I’ve enjoyed bringing it to you! 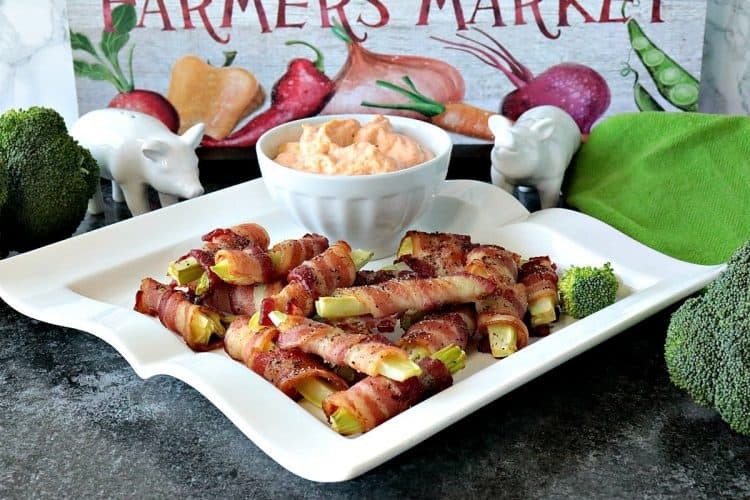 Should you have any questions regarding today’s recipe for Bacon Wrapped Broccoli Stalk Appetizers, or anything else you’ve seen on my site, please don’t hesitate to contact me directly, or leave me a comment in the comment section below. It is always my distinct pleasure to get back to you with a reply just as soon as I possibly can! Seriously, such a great idea! Cannot wait to make these!! You’ll love them! They’re delicious!! Broccoli stalks also make great noodles with the spiralizer! I’ll have to try that. Thanks for the tip! I love this idea! Such a great way to use the stalks! What an awesome appetizer! I love broccoli stalks! Thank you so much. Glad you think so!